VIFF 2016—Acclaimed playwright Kenneth Lonergan's latest film is a precise and theatrical family drama told in parallel parts about a broken man trying to do the right thing when called on after struggling to simply survive his own history of grief. Manchester by the Sea is a distinctly New England tale of obligations within extended families. 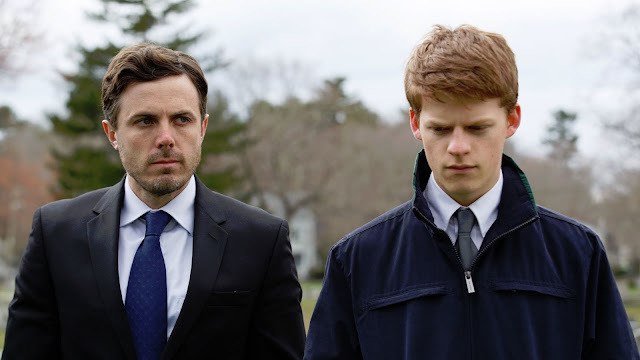 Casey Affleck anchors the film as an isolated Boston handyman who must deal with the guardianship of his teenage nephew (Lucas Hedges) in his hometown after his brother passes away (Kyle Chandler). Affleck shines as both the lovable, happy-go-luckky husband of the past and the earnest, sad sack uncle in the present as we slowly learn of his tragic life through flashbacks. Chandler is understated but effective, only ever really existing as a memory, while Hedges has a great, deadpan comedic tension with Affleck that gives the serious material some lighthearted beats throughout. Michelle Williams in a small role as Affleck's ex-wife is subtle and heartbreaking as a reminder of his sad past. Thematically, the film flirts with sweeping, emotional moments but Lonergan is too tempered and gently understates the visceral human drama on screen. Affleck appears in almost every scene and his cold demeanour in the present only highlights who he was in the past. Every character seems to have a place and moment building a in-depth family history in the film's narrative. Manchester by the Sea is a refreshing, working class New England drama about the family bonds that bind and break us. It's a haunting and often dryly hilarious story of broken families coping with loss. The way Lonergan plays with memory and relationships is heart-wrenching in its effective execution and drawing our emotions into its characters. Manchester by the Sea screened at the 2016 Vancouver International Film Festival as part of the Panorama series.